A computer without a mouse and keyboard is close to useless. But even with the conventional mouse and keyboards, you sometimes get to experience some issues. For instance a slow feedback, fading prints, or trouble figuring out the keys in dark places. If such is the situation, then it’s high time that you consider an upgrade to a more advanced keyboard/mouse combo. Among the many options out there, Cooler Master Devastators prove to be more dependable and budget-friendly. 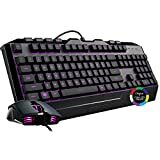 So what are the best Cooler Master Devastators out there? Well, you first need to do your analysis before rushing out to buy one. 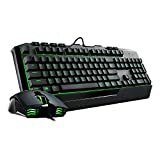 There are several keyboards and mouse combos to consider meaning that you’re not handicapped to only a couple of models. Each has its own pros and cons with some extra features that might come in handy. If you’re a serious gamer wanting to put your money to good use, then I recommend that you choose from the following best Cool Master Devastators. An upgrade from its predecessor, this keyboard and mouse combo takes up the best features and makes them even better. It’s a budget-friendly keyboard and mouse combo. The keyboard has a mechanical feel with keys that provide an impressive tactile feedback. The mouse and keyboard are lit up in green LED, a feature that makes it easier to type at night while adding mood to the task. Sporting laser-etched keys, the prints on this keyboard are designed to last; they neither fade nor disappear. There’s a precision optical sensor that puts you in total control. With it, you get to point the cursor where you want and do it fast. Such a feature makes it a handy choice for intense gaming. There are three DPI settings 0f 1000, 1600, and 2000. The grip is solid and you get an ambidextrous shape comfortable for both left-handed and right-handed persons. With a few touch ups on Devastator II, you get Devastator 3; one impressive gaming combo with color. It’s a next-generation keyboard and mouse set providing the convenience of adjustable DPI set to 2400. The mouse has an ergonomic design and sits ultra-flat for stability and great precision. You don’t have to worry about fading prints, thanks to laser-etched prints designed to stay put. The keyboard has a custom membrane specially designed for improved tactile feedback. You get a whopping 7 color options to light things up and heighten the mood. If green LED doesn’t sit well with you when it comes to Devastator II, this blue LED keyboard and mouse combo might just be the perfect match for you. It still holds the same price and boasts of exclusive switches designed for improved tactile feedback. Etched prints on the keyboard mean that the prints are there to last. A precision optical sensor provides fast cursor response and puts it where you want. The keyboard sports a non-slip rubber grip that keeps it from moving. Thanks to the ambidextrous shape, this keyboard and mouse combo can be used by persons who are left or right handed. 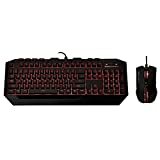 This is a solid keyboard/mouse bundle sporting bright red back lights. It’s a great option for those who don’t like the blue and green LED. The LED illuminates up the keyboard and mouse to make nighttime operation possible. You have the option of turning the back light on and off. The mouse has 3 modes of sensitivity: 1000, 1600, and 2000. The adjustable sensitivity modes give you full control. The keyboard has laser keys designed to last a lifetime without fading or disappearing. The mouse is equipped with a high precision sensor that won’t disappoint even in intense gaming applications. Are you a gamer searching for an all-in-one value kit? This keyboard and mouse combo might just put a smile on your face. 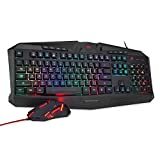 It sports not one but 4 RGB backlit mouse and keyboard. The backlight breathing speed is adjustable to 5 different levels. The prints are laser-engraved to ensure they don’t fade away. The mouse has 4 sensitivity levels designed to provide a super fast response. Teflon feet keep the keyboard literally glued to avoid unnecessary sliding.